Who wouldn’t want to sail on a luxury yacht and enjoy the tranquil beauty of the ocean. 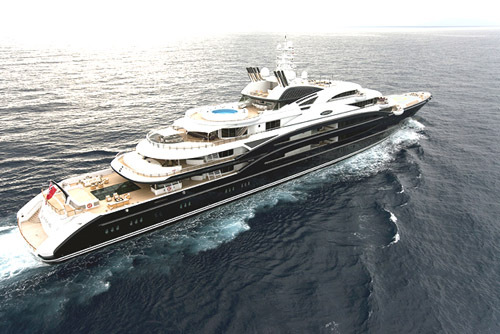 Silver Star has an awesome portfolio of luxury yachts, including the largest yacht in their fleet – M/Y Serene superyacht. To receive the ultimate luxury yacht charter experience available, the M/Y Serene is 134 meters in length and has been described as one of most technically advanced superyachts that has ever been constructed. That is saying a lot since there are some incredible luxury yachts around the world. M/Y Serene was built in 2011 by Italian shipyard Fincantieri. The stunning superyacht can accommodate up 24 guests, has a crew 52 people and features 12 luxurious cabins. For those who want to simply relax and soak in the sun’s rays, M/Y Serene offers several different swimming pools, steam room, a jet stream swimming pool, hot and cold spa pools and even a snow room! If you are an adventurous type and want to enjoy your time on the open seas to the fullest, M/Y Serene features – sea kayaks, sports fishing safeboat with full diving support, deep sea fishing equipment, various inflatable toys, two lasers, plus water skis and wakeboards. In addition, there’s a storage area for a submarine and a large internal seawater swimming pool, plus even two helicopter platforms for your VIP escape to the mainland. The interior of this incredible superyacht was designed by famous yacht interior designer- Reymond Langton. The yacht’s decor is stunning and guests will even find a drop-dead gorgeous spiral staircase. The twelve luxury staterooms include a principal’s suite, VIP staterooms and guest staterooms that come in both double and twin configurations. The spacious principal’s stateroom includes an oversize California King bed, a beautiful en-suite bathroom and a full walk-in dressing area. The attached deck has a hot tub located on the private terrace. For those families bringing children, no worries. M/Y Serene yacht is equipped to keep the little ones busy at all times. Children can have fun in the playroom, equipped with its own climbing wall. Between the yacht’s decks, kids can try the slide or visit the magical Nemo Room. For gamers, you are in luck. The yacht’s own game room comes with video games consoles, large toy collection and even a cinema to watch your favorite movies. The superyacht M/Y Serene is available for charter on the Mediterranean. So if you are looking for a memorable VIP experience aboard a luxury yacht, then fulfill your dream and cruise along the Amalfi coast of Italy in style. Please contact The Life of Luxury if you are interested taking a luxury yacht charter. We work with the best yacht charter companies around the world and can also help plan and book your entire trip itinerary. Follow our luxury blog to stay abreast of the latest luxury travel industries news and tour packages.